Tamil theatre was unarguably the biggest breeding ground for Tamil cinema, whose origin and development encouraged the easy migration and transition of actors, technicians, authors and themes from theater. It was a relationship which began in the early days of cinema and lasted right upto the 1980s. Some of the most memorable films in our industry have been remakes or adaptations of stage plays. The Tamil theater background of our greatest actors is well documented. Equally worthy of documentation is the contribution of various playwrights whose subjects were remade as films that were both critically acclaimed and commercially successful. Foremost amongst them in this regard was Pammal Sambandha Mudaliar. Born in 1873, Sambandha Mudaliar authored nearly a hundred works comprising of plays, short stories, books on religion and of course, his extremely informative autobiography. Rightfully known as the father of Tamil theater, ten of his plays were remade as films. Undoubtedly the biggest hits amongst them were Manohara and Sabapathy. This post is about the former. Manoharan, as the play was titled was Sambandha Mudaliar’s 6th play. In his memoirs “Naadaga Medai Ninaivugal”, he says that idea for the story was born when he attended a religious discourse on the life of Dhruva. The scene where Dhruva is grief-stricken on seeing the humiliation his mother suffers at the hands of his father’s second wife, Suruchi struck a chord with him and he decided to write a play with this scene as its fulcrum. Thus was born Manoharan, with the character of the second wife being replaced by that of a mistress. Sambandha Mudaliar played the title role of Manoharan. The play was inaugurated on the 14th of September 1895 at the Victoria Public Hall. Sambandha Mudaliar says that though the collections on the occasion amounted to only Rs.200, it was well appreciated by those present. The songs were composed by the legendary Sankaradas Swamigal. The climax of the play was the famous “Sangili Scene” (as it came to be popularly known amongst the public), where the hero broke free from the chains with which he was tied to the pillars. Sambandha Mudaliar writes that almost inevitably after every performance, he would collapse from the exertion caused by the scene. The play was a resounding success. Sambandha Mudaliar says that the play was staged a record 859 times (upto the year 1932) by various troupes with his permission and probably an equal number of times without his permission. 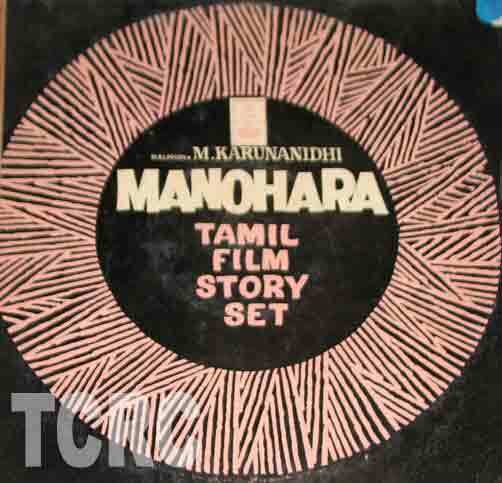 Many actors who would go on to become leading stars in cinema donned various roles in the play, notable amongst them being “Nadippisai Pulavar” K.R.Ramaswami and R.S.Lakshminarasimhan, who took on the screen name Manohar after he became famous playing the role in a college performance. Interestingly, Sivaji Ganesan played the role of the queen in K.R.Ramaswamy’s play! It was also published as a book for the first time in 1907, with subsequent reprints being made even upto the 1980s. The play was made into a movie twice. The first one, which was made in Bombay in 1936 and had Sambandha Mudaliar playing the role of the king Purushothaman sank without a trace. The second one however, made in 1954 is much remembered even today, thanks to the brilliant performance of Sivaji Ganesan. The dialogues of the original play were virtually rewritten by Mu.Karunanidhi. Film historian Randor Guy gives us more details on the film here . Here is the iconic court room scene from the film showcasing the powerful performance by Sivaji Ganesan. This entry was posted in From Stage to celluloid, Tamil Cinema. Bookmark the permalink.